SkinCeuticals is the brainchild of anti-ageing skincare scientist Dr Sheldon Pinnell. Pinnell's research paved the way for continued development and delivery of innovative skincare products that improve the overall health and appearance of the skin. The first SkinCeuticals products were the classic Serum 10 and Serum 15, which established the company as a rising presence in the beauty industry. 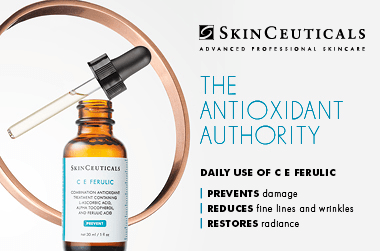 Over the years, SkinCeuticals added vitamins, antioxidants, and sun protection to its products to broaden the range. The word 'cosmeceutical' is used to describe any product that artfully blends cosmetics with pharmaceuticals. When used as directed, the active ingredients in cosmeceuticals clinically improve skin health and radiance. From the initial stages of development to final formulations, all SkinCeuticals products undergo extensive medical-grade testing to ensure efficacy. SkinCeuticals offers cutting-edge cosmeceutical product lines to address many of today’s skincare concerns, including dryness, ageing, sun damage, acne, and dark spots. www.adorebeauty.com.au is pleased to offer SkinCeuticals products as recommended by Alexandra Raymond. SkinCeuticals products contain high levels of active ingredients and are recommended for use in professionally monitored regimes. Which Skinceuticals Cleanser Is Right For My Skin? Have been searching for some products that can calm this breakouts and make my blemishes lighter.Finally im satisfied , although this product make me feel a bit dry its fine cos i have combination normal to oily skin and the skinceuticals moisturiser helps too. I have bits of bumps on the first few days but it subside and my blemish is fading. There is still breakouts but is not that active as it use to be. Will definitely purchase it again . I love the Phyto Corrective Gel. My skin is incredibly sensitive and often irritated and inflamed, and while my skin is naturally oily, I find many products leave my skin feeling raw and dehydrated, which Phyto counteracts. I use this once a day in the morning after Phloretin CF and before moisturising and have seen significant reduction in the redness in my skin. This product has been instrumental in transforming my skin from rough, dull and ageing to smooth, clear and bright. My pores appear smaller, my wrinkles softer and my skin is smoother than it's been since before I hit puberty. I haven't tried C E Ferulic, my skin is quite oily and sensitive so it was recommended I try Phloretin CF - the results have been so good I'm not tempted to try another product.